It is the future, and the United States no longer exists. It is time for the prince of the nation of Illéa to marry, and just like princes in the past, they have The Selection. 35 girls from all castes are chosen to participate. They all get to live in the palace, learn protocol, wear beautiful clothing, eat wonderful food and spend time with the prince. As time goes on, the number get whittled down as Prince Maxon gets closer to deciding who will be his bride. America Singer is a 5. The 5s are performers, artists, musicians. They are neither wealthy nor poor, though sometimes they come closer to the poor end of things. The only complication in her life is that she is in love with Aspen Leger. He’s a 6. It is almost unheard of for a girl to marry down; 6s are domestic servants, and America knows that Aspen sometimes goes without so his family can eat. They meet in secret in the old treehouse after America’s family has gone to bed, declaring their love for each other and their determination to make their relationship work. But when The Selection is announced, Aspen urges America to sign up. If she is chosen, he reasons, she will at least eat well for a few days and make extra money for her family. Then Aspen’s pride gets in the way when he feels he can’t support America as a 6, and he abruptly breaks up with her. America is devastated. Amazingly, America is chosen. Though she has no interest in marrying the prince, who she assumes is stuck up and snobby, she knows that the extra money she will be paid for participating will help her parents tremendously. Her mother and younger sister are ecstatic, her father is wistful, and her little brother is bored. America is nervous about meeting new people and whether she will make any friends. She is also resolute that she will not change and will be herself. This proves to be harder than she thought, as she immediately catches the prince’s eye, with his mind and heart following. The country has gone through many changes, and though it is a relatively peaceful time, there are several groups of rebels that want to bring the government down. They are a real threat, so the palace can sometimes feel like a prison. But the longer she lives there, the less certain she is about not wanting to marry the prince. Then suddenly Aspen re-enters her life. Which way will her heart take her? Like many, I saw the cover first before I knew anything about the book. One of the best of last year, for sure. Then, also like many, I heard about the major kerfuffle that happened among the author, her publicist, and a blogger who didn’t like the book so much. It really put me off reading it, honestly. A few months later, I decided that I was being stupid, that I needed to make up my own mind about the book. And so here we are. Is it The Hunger Games in high heels? No. But, unfortunately, there are some similarities that, due to the fact that THG movie came out a month before this book, will most likely be pointed out. Things like the lottery, the fact it is televised, the interviews, the dressing up, the controlling government, the strong female who doesn’t have a lot of money who ends up being beloved by the audience. This version, though, is definitely dystopian lite. Nothing ever feels urgent, do or die, hard scrabble, scary. It’s like dystopian inside a marshmallow. Or a dystopian pillow fight, which might be more appropriate considering all the ladies in the castle that are vying for Prince Maxon’s attentions. The attacks on the palace by the rebels don’t seem very dire, and the catty behavior between some of the contestants is pretty mild. The hard lives of some of the servants and what America experienced at home doesn’t seem to be noticed by anyone else, though I think that’s intentional. And of course, my arch-nemesis, the Love Triangle, is present and accounted for. You Might Want to Know: Mild romantic references and activity. 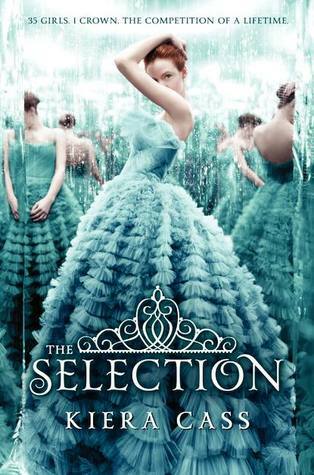 The Selection by Kiera Cass was published April 24, 2012 by HarperTeen. I have never watched the bachelor but I did enjoy this one. I’ll read book two to see if there’s some more oomph to it. I liked the characters, but I didn’t think they had enough to do. I agree that this book was….adequate? But the real test will be book two to see if she fleshes out some of the potential of the first.